[Honokaa, Hawaii, May 22-25th, 2009] — Dust off your boots, saddle up and join Honokaa Town in celebrating their heritage during the 2009 Western Week Festival! Saturday May 23rd begins at noon with the Block Party Festival at the Honokaa Sports Complex, 1 block North of Mamane Street featuring our “New Keiki Corral Loads of “Free” activities including bouncy jumps, climbing wall, games, educational displays & activities…”A barrel of family fun” , Horseshoe competition & fun, vendor booths, & displays, rummage sale, Live music & entertainment. Don’t forget to come dressed for the Lil Cowgirl & Lil Cowboy Contest! The Paniolo Parade begins at 4:00PM downtown Honokaa on Mamane Street ending at the Sports Complex, join us for this time honored tradition; Grand Marshall is Dr. William (Billy) Bergin. At 5:00PM we open the barn again with the block party featuring Live Music & fun! Members of the Paniolo Hall of Fame will be honored for their contribution to Honokaa’s Heritage with Hawaiian Style steak BBQ plates featuring local grass fed beef will be served for dinner. At 7:00PM the “Saloon Girl contest” begins, don’t miss this crowd favorite! Following the Saloon Girl Contest we begin “Dancing in the Street with “Silver Spurs”, dance to live country music till the barn closes at 11:00PM. Best dressed Cowboys & Cowgirls pulled from the crowd during the event! 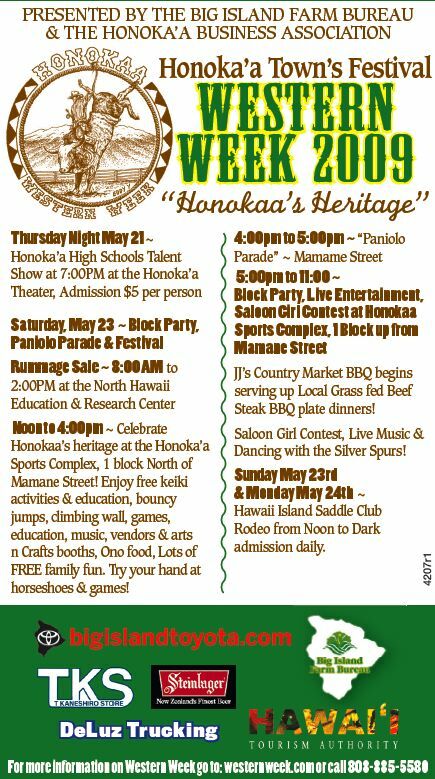 On Sunday May 24th & Monday May 25th at the Honokaa Rodeo grounds from Noon to Dark is the Annual Rodeo held by the Hawaii Island Saddle Club! For more information on Western Week please visit our website at westernweek.com or call 808-885-5580 or 808-557-2780.